If you’re heading to the beach this summer, spare a thought for safety. Around two-thirds of people in the UK go to the seaside at least once a year. Every year, RNLI lifeguards respond to thousands of incidents, saving countless lives on some of the UK’s busiest beaches. Of all the people they helped, nearly two-thirds were children. To help the beach-going public stay safe, the lifesaving charity is offering some essential beach safety tips to make sure people remember their summer holidays for the right reason. 1. Always swim at a lifeguarded beach. 2. Swim between the red and yellow flags. 4. Know your beach safety flags. 5. Never use inflatables in strong winds or rough seas. 6. If you get into trouble, stick your hand in the air and shout for help. 7. If you see someone else in trouble, tell a lifeguard. 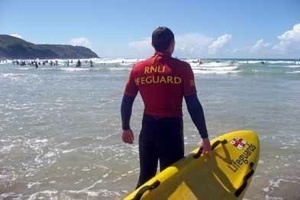 If you can’t see a lifeguard call 999 or 112 and ask for the Coastguard. 8. Find out about the beach you’re going to before you visit. 9. Check tide times before you go. 10.Read and obey local hazard signs.